Chapter 9. ALARA: What is Reasonably Achievable? 15.4 Is Thorium a Viable Substitute or Supplement for Nuclear Fuel? 19.11 Is Bribery Unavoidable in This Context? Social and Ethical Aspects of Radiation Risk Management provides a comprehensive treatment of the major ethical and social issues resulting from the use of ionizing radiation. 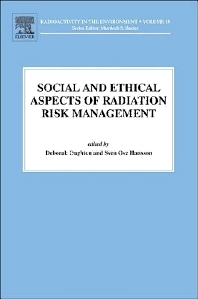 It covers topics such as nuclear fuel cycles, radioactive waste treatment, nuclear bomb testing, nuclear safety management, stakeholder engagement, cleanup after nuclear accidents, ecological risks from radiation, environmental justice, health and safety for radiation workers, radiation dose standards, the ethics of clinical radiology, and the principles of radiation protection and their ethical underpinnings. With authors ranging from philosophers to radiation protection officials and practitioners, the book spans from theoretical to practical implications of this important area of radiation risk assessment and management. Deborah Oughton is professor in nuclear and environmental chemistry, and research director of the Centre of Environmental Radioactivity, at the Norwegian University of Life Sciences (UMB). Since the early 1990s, through the support of the Norwegian Ethics Programme, she has combined a career in science with study and research on the ethical implications of radiation risk. She currently holds an associated professorship in Research Ethics at the University of Oslo, is deputy head of the National Committee on Research Ethics in Science and Technology, and ethics coordinator at UMB. She has published widely in both science and ethics, and has been a strong advocate of putting ethics into practice in radiation risk management. Sven Ove Hansson, professor in philosophy, is a leading expert in the ethics of risk and one of the few moral philosophers who have written extensively on the ethics of radiation protection. In addition to being a moral philosopher, he is also a logician and a decision theorist. He is editor-in-chief of Theoria and editor of the book series Studia Logica Library: Outstanding Contributions. He is a member of the editorial boards of Synthese, Studia Logica, and the Journal of Philosophical Logic; member of the scientific editorial board of Philosophy & Technology; and area editor of the book series Logic, Argumentation & Reasoning. His books include The Structure of Values and Norms and Ethics at Peril. He is the author of well over 250 articles in refereed journals. He is member of the Royal Swedish Academy of Engineering Sciences (IVA) and President of the Society for Philosophy and Technology.